Excerpts from Rob Clough's article in The Comics Journal. The Association of American Editorial Cartoonists (AAEC) has been meeting annually since it was formed in 1957. 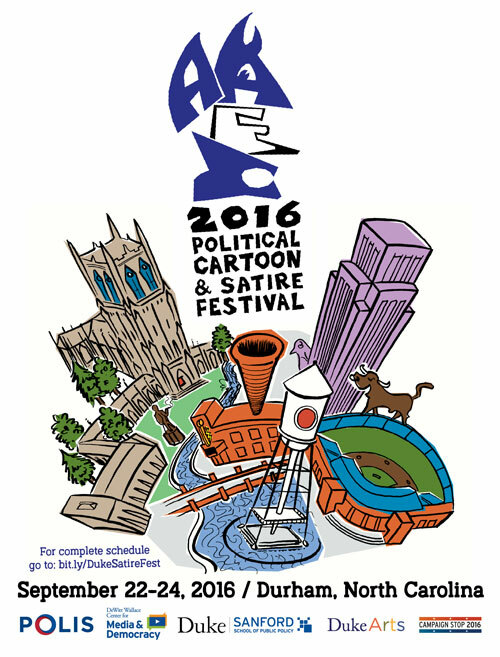 Their 60h meeting was held September 22nd-24th in Durham, North Carolina, in conjunction with Duke University’s Satire Festival. During the opening reception, show co-organizer J.P. Trostle said, “Wow, North Carolina is hell-bent on making this one of the most interesting and timely conventions we’ve ever had.” Trostle was referring not just to the passage of the odious anti-trans law HB2, but also to yet another victim of police violence, this time in nearby Charlotte. Indeed, there was some internal debate within the AAEC as to whether the festival should be held in Durham, given HB2, but it was decided that an organization whose purpose is to make pointed political commentary would be an ideal match for this controversy. The meat of the AAEC programming was a slate of panels held in a theater on Duke’s campus. The subjects ranged from craft-related topics to larger political issues, and true to the AAEC’s history, the ideas came from both sides of the political aisle. For example, there was a panel called “Finding The Elephant’s Funny Bone”, which was about humor from a Republication perspective. There were panels on cartooning in the age of social media (both in dealing with online fallout and integrating it into one’s platform), the craft of caricature (especially in an election year), and the issues surrounding satirizing two huge targets in that race. 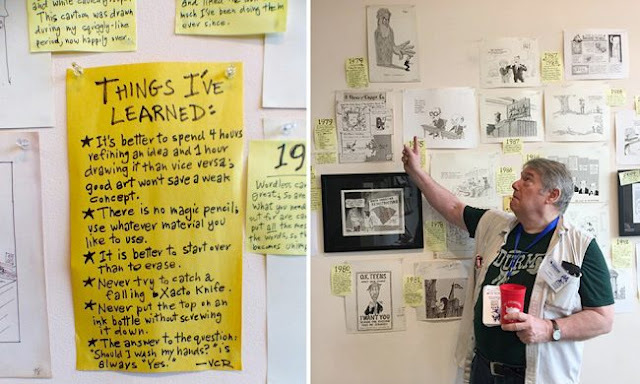 The “Bathroom Banter” panel included cartoonists and a reporter discussing the issue, and the fact that this was a local matter made the interaction with the audience particularly lively. The panel went into specific detail about why HB2 is a poor piece of legislation qua legislation, and how it’s simply a thinly-disguised way of garnering socially conservative voters in an election year. The panel titled “Black and Blue: Cartooning #BlackLivesMatter and Policing” seethed with rage and tension, coming as it did just a few days after the slaying of Keith Scott by the police in Charlotte. On the panel were Darrin Bell (cartoonist for The Washington Post and the creator of the strip Candorville), Keith Knight (the artist behind long-running features (th)ink, K Chronicles, and The Knight Life), North Carolina senator Mike Woodard, and moderator Jim Coleman of Duke’s law school. Bell had actually stopped doing political cartoons quite some time ago, until the murder of Mike Brown spurred him to get back on the scene. Knight’s chronicles of police brutality have been voluminous enough to merit an entire collection, titled They Shoot Black People, Don’t They? He did a short version of the slideshow that he’s lately been performing live, one that is regrettably already out of date, thanks to recent events in places like Charlotte and Tulsa. If Knight and Bell showed how speaking truth to power can be a dicey proposition, the “International Ink” panel made that even clearer. Rayma Suprani of Venezuela, Gado of Kenya, and Rod Emmerson of New Zealand each spoke extensively about the unique challenges facing their nations and the blowback and threats they’ve received while addressing them. Suprani was fired in 2014, after nineteen years from her paper El Universal, for publishing a clever cartoon critical of deceased former president Hugo Chavez. She eventually left the country after fielding some not-so-veiled threats. Her work is colorful, clever, and uses a thick line weight to bring home her points. Gado, originally from Tanzania and one of the most important and popular cartoonists in east and central Africa, was also fired by his paper after criticizing the government. Gado’s skill with pen and ink is staggering, and his work is very much in the tradition of US cartoonists like Tom Toles and Pat Oliphant. The main difference is that he’s even blunter and meaner than those two legends, and that attitude extends to his use of puppets and animation to reach a larger audience. Rod Emmerson of New Zealand by way of Australia spoke of the way that some of his cartoons offended foreign nations but that he felt lucky that his paper always had his back. There’s no question that all three cartoonists would be major heavyweights in the US, and listening to each of them discuss the state of freedom of the press in their countries was sobering. 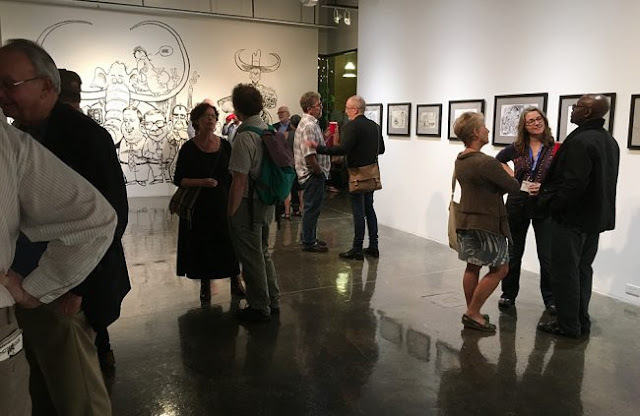 In addition to the festival’s events, there were various exhibits in conjunction with the festival that highlighted local artists and solicited a wide range of opinions regarding key topics. V. Cullum Rogers points out a few favorites in his show at Bull City Arts Collaborative. V. Cullum Rogers had a career retrospective with a focus on his developing skill as an artist over the years. Longtime Raleigh News & Observer editorial cartoonist Dwane Powell also had a career retrospective covering the last forty years, a time when the state of North Carolina made tremendous, progressive strides while also dealing with reactionary forces in the form of Senator Jesse Helms, current Governor Pat McCrory, and the sitting legislature. The state’s underlying racial tension and history of activism, the stark differences between its urban and rural areas, and shifting sets of priorities have made it a microcosm of larger issues affecting the entire country. 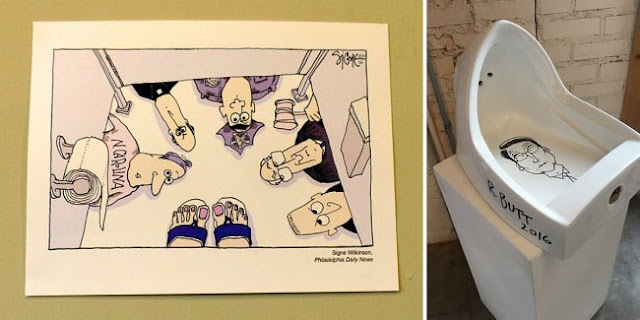 Signe Wikinson (left), and J.P. Trostle’s homage to Marcel Duchamp, with a caricature of NC governor Pat McCrory. That was made clear by the “Bathroom Humor” exhibit, which was a selection of editorial cartoons regarding HB2. It’s always exciting to see a wide variety of drawing styles, techniques, and philosophies. There were old-school editorial “labelers,” pen-and-ink stalwarts, artists who did it all digitally, artists who relied on color, etc. This is a uniquely meaty editorial topic because on the one hand, the rationale given by the governor is indefensible by any legal standard and incredibly poorly-thought out. It’s also embarrassing to the state at large, not only in terms of reputation but also in terms of economics, thanks to lost revenue due to business pulling out. At the same time, it’s incredibly timely and emotionally powerful issue to consider as LGBT rights are still in their relative infancy in this country, and this is a direct attack. Even without all the local intrigue, this was an AAEC convention held during a presidential election year, which meant there were some fireworks. The fact that it was held during possibly the weirdest election of all time in the US only gave the cartoonists more material to work with on both sides of the aisle, and that could be seen in the exhibit “This Campaign Is Yuuuge! : Cartoonists Tackle The 2016 Presidential Race”, curated by Rob Rogers. The irony of the exhibit, and perhaps the entire event as a whole, is that no matter how absurd the cartoonists got in their satire, the actual reality of the campaign has managed to consistently top that level of absurdity. While satire is needed more than ever in a time when Hilary Clinton’s hand in making the primaries go her way, and when Donald Trump abandoned the slightest pretense of tact, dignity, or being grounded in reality, it’s getting more and more difficult for the satirists to keep up. Still, the mere fact that Trump has chillingly hinted at shutting down his many editorial critics if he’s elected president is a stark reminder of what’s at stake, especially as so many cartoonists are putting their lives on the line in places like Africa, the Middle East, and Malaysia. The art of editorial cartooning is very much still alive, even if the business of editorial cartooning continues to look for solid ground on shifting sands.